12AWG wire: 12 gauge high-strand count wire, silicone insulation, "wet noodle" style. Package has 1m of Red, & 1m of Black wire. Highest quality; high amperage capability. 10AWG wire: 10 gauge high-strand count wire, silicone insulation, "wet noodle" style. Package has 1 meter of Red, & 1 meter of Black wire. Highest quality; high amperage capability. 8AWG wire: 8 gauge high-strand count wire, silicone insulation, "wet noodle" style. Package has 1 meter of Red, & 1 meter of Black wire. Highest quality; high amperage capability. 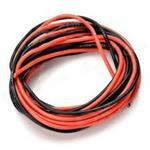 16 Gauge Silicone Wire Pkg: 10 feet Red & 10 feet Black. High-Strand-count copper wire, with Silicone insulation.